Ideal private home & horse property just a few minutes west of C470 & US 285. At the end of a pastoral country lane w/a beautiful grassy yard lined by tall pines highlighted by a remarkable custom home & well built 30x20 barn/stable and a greenhouse. 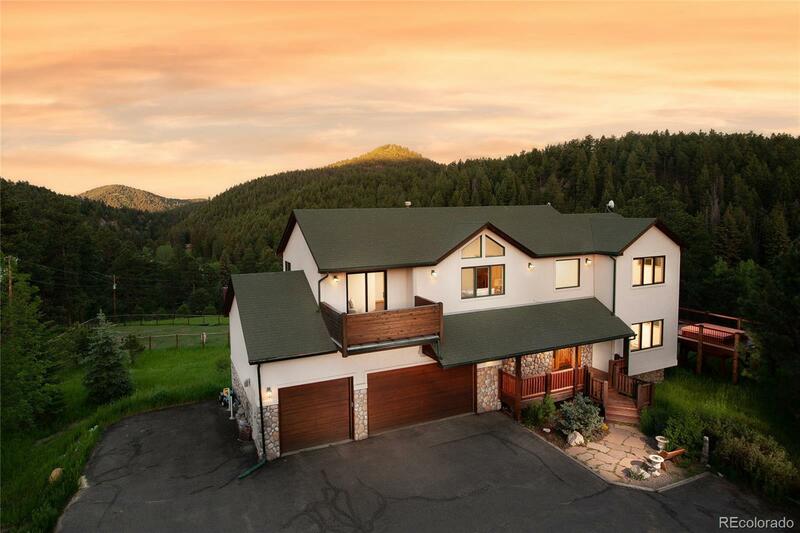 Boasting Mountain Contemporary architecture w/vaulting & natural light, awesome views. A huge master suite with retreat, large walk in closet and private deck. Well built w/in floor radiant heat and upgrades galore. Easy driveway and 3 car garage, w/well constructed fencing-a great place to board horses. Custom log accented stairway becomes the centerpiece of the entryway. Bright kitchen w/beautiful pine cabinetry & large granite island below walls of windows, skylights in vaulting w/exposed beams. Room for everyone-each bedroom has direct access to a bath & decks all around! The walkout basement is the ultimate play/gaming area w/slate built ins & wide open spaces. Adventure around on nearly 3 acres of quiet, wholesome living!